Moscow has condemned the massacre of civilians in the ancient city of Palmyra, urging the international community to denounce double standards in its approach to fighting terrorists, and unite against IS (Islamic State, formerly ISIS/ISIL) aggression. “We strongly condemn the atrocities committed by armed extremists in Palmyra,” the Russian Foreign Ministry said in a statement. “Once again, we urge international and regional parties to abandon the vicious practice of using double standard approaches to fighting against terrorism, and launch efficient cooperation with the governments of Middle East countries, which are directly repelling the ISIS offensive,” the ministry said. Moscow believes that US-led airstrike campaign against Islamic State positions in Iraq and Syria have not done enough to impede the jihadists’ advance in the two Middle Eastern states. The ministry believes that recent gains by the militants in Syria, and the brutal executions of civilians that followed, demonstrate the ineffectiveness of the coalition’s approach. 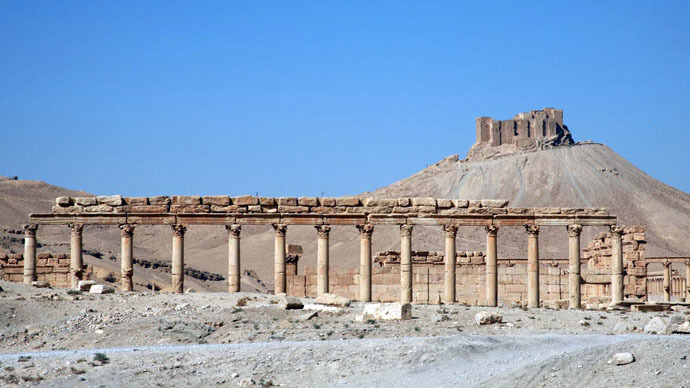 IS managed to capture the 2,000-year-old ancient ruins of the world heritage site at Palmyra after seizing the city’s intelligence headquarters, military air base, and prison. According to witness testimonies, IS fighters have staged mass executions of prisoners of war and anyone loyal to Damascus, killing round 400 people in the last couple of days, including women and children. Some 600 more of the city’s residents have reportedly disappeared, their fate, as of yet, unknown. The jihadists now control more than half of Syria’s territory, according to London-based Syrian Observatory for Human Rights. The capture of Palmyra comes shortly after the terrorists seized control of the city of Ramadi in the Anbar province of neighboring Iraq. In order to avoid further bloodshed in Syria and Iraq, Moscow called for a united front to fight the radicals. “Radicals can be stopped, as Russia consistently proposes, only when the international community unites its efforts on a generally recognized basis of international law and strict implementation of UN Security Council resolutions,” the ministry said.